Every now and then my iPhone has this issue where it can’t tell time properly. I wake it up, and it shows me a time several hours ago, then as if waking from a drunken stupor, slowly tries to catch up to reality, moving the clock forward by a small, random number of minutes. During these episodes the whole UI is sluggish, and it apparently doesn’t even accept phone calls. When “phone” is 5/6 of your name one would think at least that would work all of the time! Check out this screenshot from the missed call sheet. 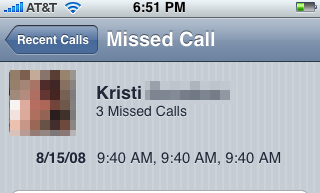 It recorded 3 missed calls that arrived over the course of an afternoon all with the exact same arrival time, 9:40 AM. The phone never rang. That was with v2.01, so I sure hope this is fixed in the future. Update: to Frank’s comment – this wasn’t a matter of the phone bouncing between time zones. The phone’s time isn’t a whole number of hours behind. Mine had a time problem too. When I went to Montana it would alternate between central and mountain time. Nothing seemed to fix it. I just installed the 2.0.2 update, but since I’m not planning on being in Montana for a while (at least) I won’t be able to test it. Who is this Kristi who calls you incessantly? Why are you avoiding Kristi’s calls and using bogus blog post for an excuse. Just answer your phone.